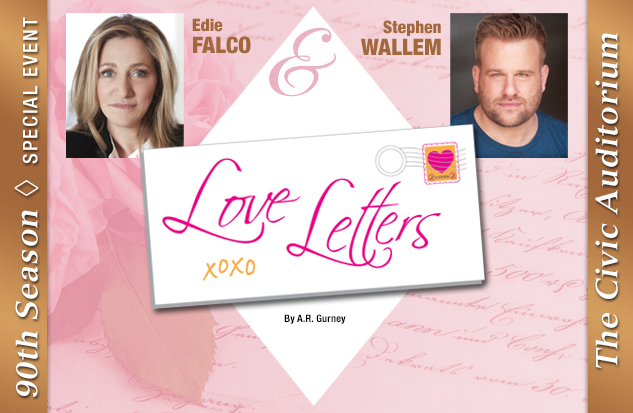 Television and Broadway veterans Edie Falco and Stephen Wallem will entertain Kalamazoo audiences in a very special production of A.R. Gurney s play, Love Letters on the Civic Auditorium stage. Love Letters is the story of a 50-year correspondence between Melissa Gardner and her childhood-friend-turned-love-interest, Andrew Makepeace Ladd III. An evocative, touching, frequently funny play where what is implied is as revealing and meaningful as what is actually written. Love Letters will be an evening at the Civic you will long remember! A fundraising event marking the Civic s 90th Anniversary Season, the ticket price also includes a post-show reception. NOTE: * Denotes member of Actors' Equity Association, the Union of Professional Actors and Stage Managers.